I had loaned this tape out and was lost for a while. When i finally got it back, this train-wreck was on it! So I apologize for the first 13.40 minuets of side B. 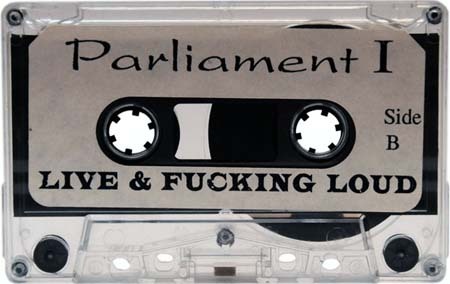 40:40 on Side A was classic Parliament flava..
Great times at Parliament parties….Wish i could have been there for the reunion party. I think it was an amazing fun treat where it was off the hook fun! who mixed this tape? was it brownie? Brownie always blew my mind!!!!! I was there at the bank !still a night to remember ! I was at the bank that night. A night I’ll always remember. Yes, that bank vault was dripping sweat! What a party. Looking back it’s a bit scary some of the places we crammed into..